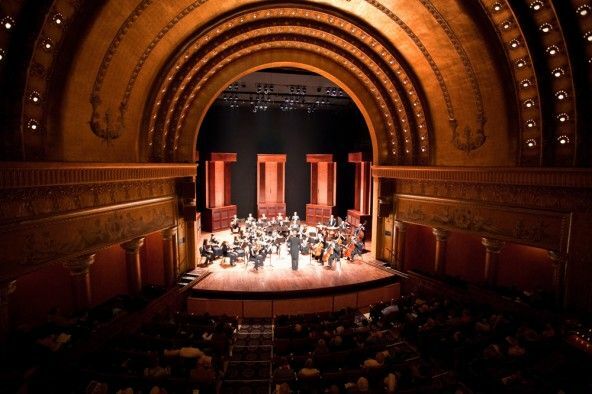 Under the direction of Co-Founder and Music Director, Timothy Russell, the orchestra has sustained over three decades of world-class performances, impacted the community through education and outreach programs, and drawn national attention to the Columbus arts scene through innovation and musical merit. The orchestra has won 8 awards from the American Society of Composers, Authors, and Publishers (ASCAP) for Adventurous Programming and has received various additional awards, including those from the Greater Columbus Arts Council and the Columbus Jewish Foundation. Timothy Russell is also the recipient of two Grammy nominations. As a leader in performing new and contemporary repertoire, ProMusica has commissioned over 50 pieces and has presented more than 100 premieres. In recent seasons, the orchestra showcased a regional premiere of Modest Mussorgsky's Pictures at an Exhibition, as arranged by Clarice Assad and a commission and world premiere of Hestia’s Fire by Evan Chambers. ProMusica also continues an active recordings program with eleven CDs released to-date, including Triumvirate (2011) and Resounding (2011). Special events bring classical music to new audiences and celebrate ProMusica musicians and guest artists. The annual Spring Soirée showcases crossover artistry, recently featuring Three Mo' Tenors, Gabriela Montero, Jane Monheit, Bela Fleck & the Flecktones, Eileen Ivers, and Mark O’Connor. Additionally, the Artist Circle series engages audiences in intimate settings.